CONCORD, NC (WBTV) - Sam Bass, NASCAR’s first officially licensed artist, passed away on Saturday following a lengthy battle with kidney disease. Bass created countless different works ranging from car designs to program covers that have been viewed by NASCAR fans across the country. 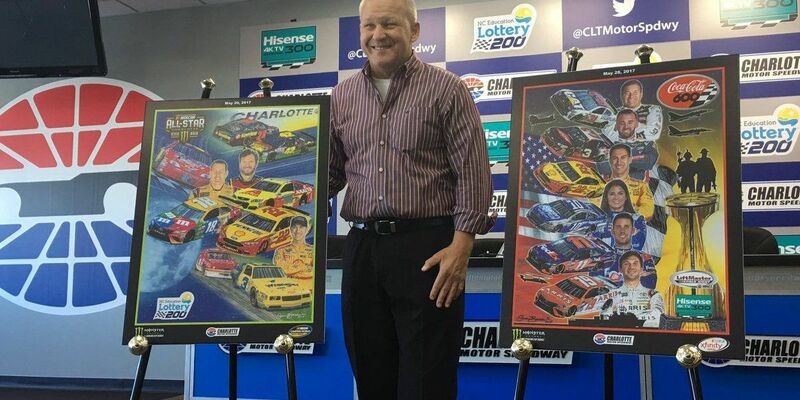 “I’ve painted well over 10 thousand hours of my life working on program covers for Charlotte Motor Speedway,” said Bass, in 2017. " So quite a bit of time goes into these things." Bass’s work has included the ‘Rainbow Warrior’ design on Jeff Gordon’s legendary car to dozens of program covers ranging from the one for Dale Earnhardt Jr.'s last race in Charlotte to the inaugural Monster Energy All-Star Race. Bass created many of the works that would be seen by millions of NASCAR fans over the years out of his studio in Concord which had been visited by countless different drivers and figures affiliated with the sport. Upon hearing the news on Saturday, many of these individuals offered their condolences in statements and through social media posts, praising his works as well as his pleasant, kind personality. He was a positive influence on @NASCAR as an artist. A friend to everyone he met. The nicest person, always smiling, always thrilled to see you again.